The Mahindra Thar Wanderlust made its debut at the Auto Expo 2018 and went on sale as a customisation kit for existing and new Thar owners in April at a price of INR 13.8 lakh. Finally, we have the first images of the company-modified Thar driving on the streets. The various styling updates on the Wanderlust makes it quite challenging to find a resemblance to the Mahindra Thar. In comparison to a factory-spec, the Wanderlust comes across as a more rugged and an off-road-oriented version. 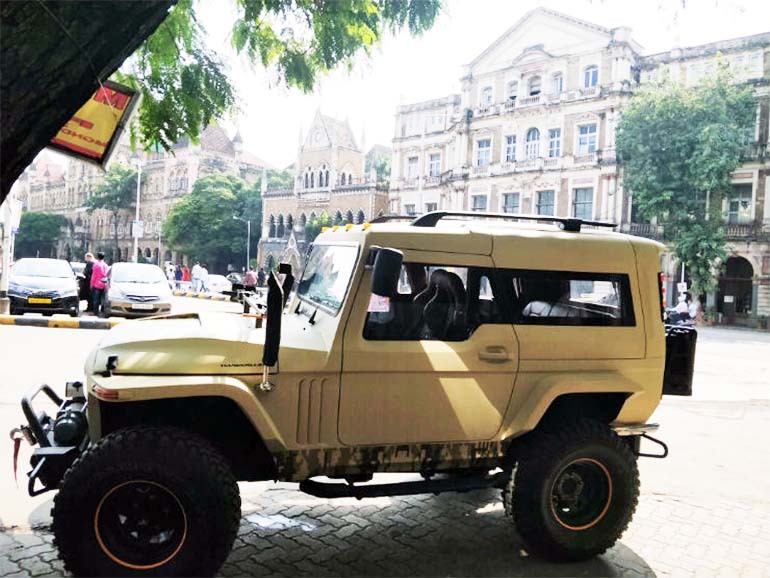 At a casual glance while it doesn't look like it is based on the Thar, there's a definite similarity with the Daybreak Edition showcased at the Auto Expo 2016. The Wanderlust comes across as a road-legal, more upmarket version of the Daybreak. 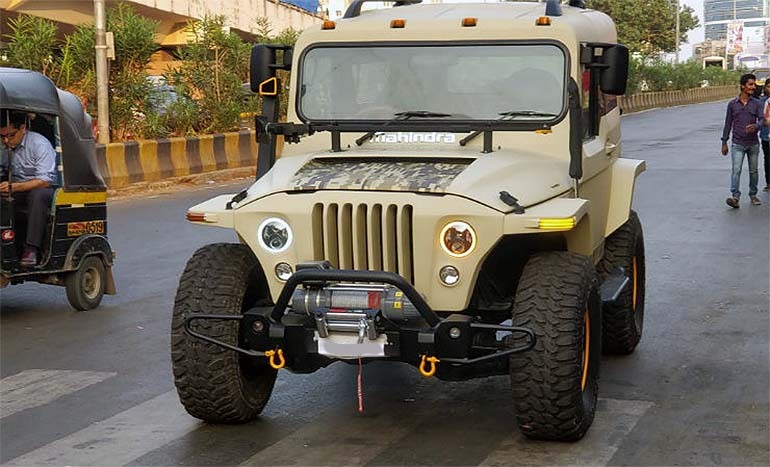 The front-end of the Mahindra Thar Wanderlust features LED projector headlamps with LED DRLs, a new version of Mahindra's signature 7-slat grille, LED turn indicators, and an off-road spec metal bumper with an electric winch mounted atop it. The hood is new and gets custom graphics. The biggest highlights of the side profile are the gullwing rear doors. Other highlights include high-mounted rear view mirrors and silver-finished roof rails. The rear-end is characterised by LED tail-lamps, two canisters, and a roof-mounted spoiler. While the original suspension setup has been retained, customers can opt for a lift kit. On the inside, the Mahindra Thar Wanderlust gets a dual-tone setup with full leather upholstery. Other highlights include sports pedals, an Android-based touchscreen infotainment unit from Pioneer, ambient lighting, and a head-up display. The side-facing rear seats have been replaced with a front-facing bench seat. The gullwing doors make ingress and egress relatively more comfortable than before. We feel that the Mahindra Thar Wanderlust is a more practical option for those who want to use the lifestyle SUV as a regular runabout. Powering the Mahindra Thar Wanderlust is the familiar 2.5-litre CRDe turbocharged diesel engine that produces a maximum power of 105 bhp @ 3,800 rpm and a peak torque of 247 Nm @ 1,800 - 2,000 rpm. The engine comes mated to a five-speed manual transmission. The Mahindra Thar Wanderlust spotted is reportedly made for the Royal family of Udaipur.